It’s easy to buy Skype Credit in Skype Manager. You can pay for Skype Credit using a credit card, PayPal, Sofort banking, and lots of other ways. Once you have purchased some Skype Credit, you can allocate it to your members. Important: When you set up Skype Manager, there is a limit to the maximum amount of Skype Credit you can purchase, which depends on the payment method you use and how much Skype Credit you've already purchased in any given month. The range of payment methods available to you is also limited. Click Buy Credit from your Skype Manager Dashboard. If this is the first time you have bought Skype Credit for your Skype Manager, select your payment method, and click Next. 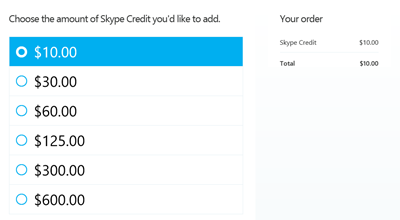 Select the amount of Skype Credit you wish to buy. 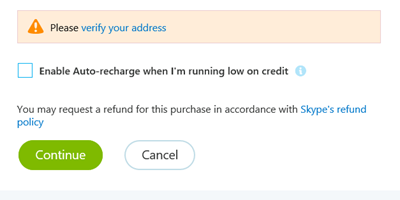 If you are buying Skype Credit with a credit card or PayPal, enable or disable Auto-recharge. With Auto-recharge, you can recharge your account automatically when your Skype Credit balance falls below a certain amount. Do this by checking the Enable Auto-Recharge when I'm running low on credit box. Verify your payment method and click Pay now. Confirmation of your purchase will be displayed. Learn more about how to change your Auto-recharge settings. Learn more about how to view your purchase history and how to download invoices.